This award recognizes that AESD is leading the way with learning opportunities as outlined in the Every Student Succeeds Act (ESSA). The legislation guides implementation in the states and replaces the No Child Left Behind Act (NCLB) which was often criticized for an overemphasis on testing-while leaving behind subjects such as music. ESSA recommends music and the arts as important elements of a well-rounded education for all children. "As music educators, we believe in the power of engaging students through the rich opportunities that a music program can offer,” said Mark Anderson, AESD Music Educator. “Music is about cooperating and creatively communicating with others in order to achieve a common goal or skill. We are so proud that the music program at Anaheim Elementary provides every student with the opportunity to build upon and discover their musical gifts, enrich their lives, and experience learning from a different perspective." Anaheim Elementary School District is the only K-6th elementary school district in Orange County to be recognized with the Best Communities for Music Education award; AESD is among only two elementary school districts in the State of California and three in the nation to receive this honor. The Anaheim Elementary School district serves more than 16,000 students at 23 campuses in the City of Anaheim, making us the largest elementary school district in Orange County and the second largest in the State of California. 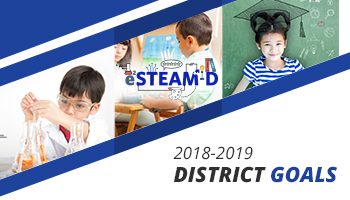 We are committed to providing engaging and equitable learning opportunities for all students through our STEAM, Dual Language, and music education programs, which are available from TK through 6th grade. Our award-winning schools, nationally recognized innovative programs, and one-of-a-kind community partnerships make us an educational leader in the region that prepares students for success in the 21st Century.